There are many ways to look at advertising-as a business, a creative communication process, a social phenomenon, and a fundamental ingredient of the free-enterprise system. 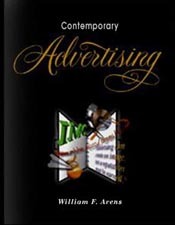 The first part of this text defines advertising, examines the most important dimensions of the field, considers how changing economics has influenced the evolution of the profession, outlines advertising’s functions and scope, considers its social and legal ramifications, and looks at the major participants in the advertising business, not just in North America but around the world. Read Chapter 1: What is Advertising Today? From William F. Arens, Contemporary Advertising/10th Edition, 2005. Reproduced with permission of The McGraw-Hill Companies. All rights reserved. Copyright © 2005, The McGraw-Hill Companies. All rights reserved.